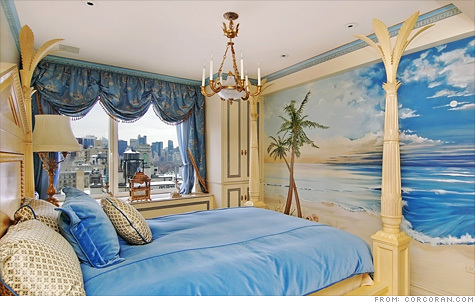 NEW YORK (CNNMoney.com) -- Conservative radio host Rush Limbaugh is saying adios to the Big Apple and selling his Fifth Avenue penthouse, asking almost $14 million. Limbaugh bought the 10-room condo at 1049 Fifth Ave. in 1994 under the name of R H Trust, according to city property documents. The pad sprawls across nearly 5,000 square feet and two of its terraces overlook Central Park and its famous reservoir. The pre-war property features a double living room; a wood-paneled library; four terraces; enormous baths; and a maid's room. But it's not for the faint of heart -- or those afraid of a big renovation. The general appearance can be described as, well, ornate, with trompe l'oeil ceilings and mural-covered walls. Other lavish features include gold leaf moldings, mahogany floors, upholstered walls and an Italian marble foyer. Luxury broker Corcoran Group is listing the property, but the firm chose not to release photos or confirm the celebrity resident. Limbaugh was not available for comment. So what's all that worth? Limbaugh hopes to get $13.95 million for his home. For the tax rolls, the city values the property at $1.56 million and says property would rent for more than $26,000 per month. Limbaugh, host of "The Rush Limbaugh Show," has been a major voice in the conservative media arena for decades. In 2009, the pundit said he would sell his property after New York governor David Paterson proposed a so-called "millionaire's tax" on residents who make more than $500,000 a year.